The kids were expecting we would play them eventually, so no one spoke up the day of turning in the artifact. We watched The Book Thief movie, wrote a reflection on the novel, introduced the next unit, and were a few weeks away before anyone raised their hand and tentatively asked, “Why didn’t we play the board games we made for The Book Thief?” The horrible answer: I didn’t build enough time in the calendar to allow for that activity, and I was not yet confident enough in my curriculum to toss my carefully laid plans to the wind just to play games. It was a mistake on my part and this lesson plan haunts me. Even now, I’ll have sophomores enter my classroom and remind me of my wrongdoing. But this year, we played those games. And it was AWESOME. Under the same premise as last year, students were asked to complete a project, and five of them chose to create a board game. One board game a student created was akin to the Game of Life, but instead was the Game of Death, referencing that the narrator of The Book Thief is the character Death. The entire game is spent collecting ‘words’ which act as currency, since a huge theme of the novel is that words are powerful. You collect the words based off your career and income, which include jobs like being a nazi. Doesn’t it sound amazing? The best part of this entire game was a secret rule, where you gain more books by stealing them from your fellow players! Another game created was similar to Mad Gab. If you’re familiar with the traditional format of Mad Gab, you say strangely phonetic phrases at various speeds until they sound like common phrases that you recognize. In this version, students deciphered quotes from The Book Thief! A different student created The Book Thief trivia Shoots and Ladders. One student had a game that included four separate player boards, each individually formatted for a different character from the novel. Finally, one student stole my heart with her artistic game that used house keys as player tokens for her game, because Max, a Jewish man in WWII Germany, received a key hidden in Mein Kampf that led him to freedom. There was a moment where I almost fell into the same time trap that ruined everything. I had planned to devote an hour of the class period to playing games, with the other thirty minutes allocated for watching the film version of the novel. But the kids were having such an amazing time, laughing and engaging with each other, all the while talking about the book (please, pause, and just soak that in—fourteen year olds having fun while talking intensively about a BOOK) and I made an executive decision: We spent the whole 90 minute block period playing those board games. It was the right call. 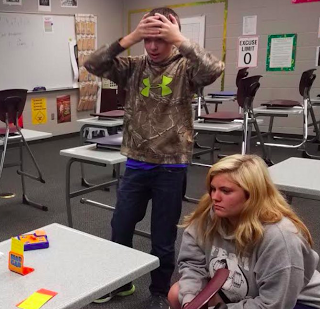 We can’t deny the value of having students create relevant board games for the classroom. It is clearly a valuable teaching tool, and gives the class a way to come together as a community. There is nothing so bonding as a getting heated about a competitive board game! While researching board games in the classroom, I read this article, “Making Board Games in the Classroom,” by Anastasia Salter and she proposed an idea I had never considered: teachers make board games for classroom learning. Wow! I have known of teachers who use mass produced board games in their classrooms, like Pandemic and Evolution, but I had never considered making my own board game that specifically pertains to the needs of my classroom. Salter provided a simple Prezi for any beginner to board game creation that is very helpful! It is my hope sometime before the year is over to create a class set of board games for a different unit. Outside of the school day, I am an avid player of board games. I have ventured the trains in Ticket to Ride and built castles in Castles of the Mad King Ludwig. I’ve farmed with La Granja and have trained monks in Orleans. 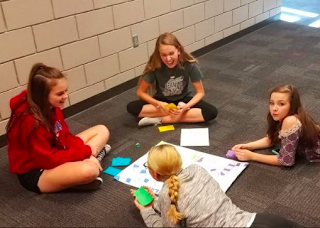 Board games are a big part of my free time; I am so glad I am able to bring a widespread interest into my own classroom. This intersection of fun and education is the pinnacle of my experience as a teacher. If you have any questions, please feel free to email me at andreamarshbank@gmail.com. You can also find me on Twitter at @msmarshbank, Instagram at @amarshybank, and Linked In at Andrea Marshbank. Nov 22 What is Blended Learning?